Picked this up at the biggest beer store in the UK, Beers of Europe Ltd. Clear copper-yellow pour with big, fluffy two finger head with good retention and lacing. Hoppy, perfumy, floral nose with a malty backbone and hints of apples and caramel. Nice tangy, citrusy, bitter hop bite in the taste, well balanced by a sweet malty caramel base with a hint of apples and bubble gum. The mouthfeel is crisp and dry and slightly fizzy with a touch of chewiness. Slightly higher ABV then your typical English IPA, but you definitely can't tell. I'm thinking that some of the critical reviews were due to beer past its prime. This was extremely drinkable and enjoyable. It was closer to an American IPA then I had expected. Pleasantly surprised! Imperial pint poured into an imperial pint glass. L---Dark golden color. Thick, puffy white head that stuck around for a while but left minimal lacing. S---Hops are noticable but not dominant. They are played on by spices. T---Really nicely balanced. Nothing is dominant, but many things come together nicely. Malts and hops are expertly balanced against each other. F---Creamy & wet. Well carbonated. O---A very nice beer. Well suited for the season, but would easily travel to warmer climes. I wish I had more than the one. Crystal clear bright amber. The second pour adds a fair amount of yeast and hazes things up a bit. The small head is off-white and settles quickly to a thin film. Acceptable, though not abundant, lacing. Citrus hop nose with notes of grapefruit (primarily) and lemon peel (secondarily). There's plenty of hop bitterness on the palate, though it's far from overdone. Well-balanced for the style. The first few sips were a little metallic, but after that it was fine. Pretty good mouthfeel; no complaints. The relatively low ABV (for an IPA) adds to the drinkability. This beer is nothing like a traditional Christmas beer. I respect the brewery's right to call it anything they want, but they might as well have called it Crazy Cupid or Psychotic Bunny as Bad Elf. If you're in a holiday mood, drink a Troegs Mad Elf or any of the other spiced ales. 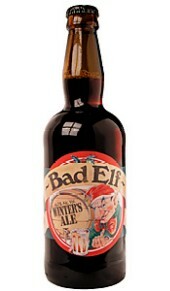 If you want a respectable IPA no matter the season, reach for a Bad Elf. A 500 ml bottle poured into a large tulip glass yields a bright amber body with a touch of haze and a layer of thin, bright white foam atop. The head recedes quickly into a bubbly ring that leaves a few scraps of lacing on the glass. The smell of the drink is spicy and tartly citrusy with a little pine and solid note of mild and mellow pale malt. The taste is mild and pale malty with a sweet orange undertone and a grapefruit pithy bitterness. Though pretty meek overall, the citrusy hop flavors predominate, and very little bitterness and only the faintest touch of earthy dryness marks the finish. The drink is light-medium in body with minimal carbonation. A nice drink and very citrusy for an English IPA. Pours golden with a slight haze. Tall head with excellent lacing. Strong malty aroma that translates to a big hit on the tongue. Finishes a bit weak for my taste, but has a very creamy mouthfeel. Hops are here more for aroma than taste. Tried laying one down from last year and the beer did not fare well. Won't do that again. Pours a golden yellow, not much head, great lacing. Smells of stone fruits, apples, rasberries, lots of floral earthy hops, . Tastes of fruity malt, semi-sweet, almost like a cider. Bitterness is pretty mellow, mostly floral. Finishes fairly sweet with just a touch of dry hoppiness and more apple and pear fruitiness. Decent mouthfeel, good carbonation. An interesting beer, i wouldn't think its an English IPA, very fruity, not sure if its from the malt, yeast, hops or a combination. Not too bad though, if you like english fruity beers. Appearance: Golden and clear, with a white head. Well that's certainly a surprise, you expect winter ales to be dark. Taste: Wow! Really great bready malt flavor here. Also there's Goldings hops, I believe, but it's not over powering. Slightly bitter. Mouthfeel: A little on the thick side. Drinkability: For what appears to be a beer being sold for its amusing label, they certainly put a lot of good ingedients in it. Very tasty. Clear bronze with a fluffy off white head that leaves scaps of lace behind on the glass. The nose is bready and grainy with grapefruity hop notes. Candied orange and lemon zest with a rich malty backbone, pretty nice. Medium bodied with lively carbonation. a nice English IPA and my favorite of the Ridgeway holiday offerings I've tried. Part of sampler pack I received for Christmas. Poured from bottle into New Belgium globe glass. A: Fairly light glowing coloring with minimal head that left some oily qualities behind and nice lacing. Almost a little hazy, carbonation not too apparent. S: Nice fruity nose, mild citrus qualities to it. T & M: Rather light bodied. Fruity, orangish qualities from nose come out in the taste as well. Decently balanced although a little more malt backing would have been good. D: Quite drinkable, I really enjoyed this beer. Looking forward to trying the rest in the sampler from Ridgeway. Appearance: Light amber in color. Very nice three inch head of frothy white head. Smell: Earthy smell of an old basement (in a good way). Sweet notes of spice. Mouthfeel: Very full mouthfeel due to the ample head which leaves nice lacing on the glass. Drinkability: What's not to like about this English Ale. Open and drink another. S-A very light malt/bread smell with a hint of citrus. There is not much going on here. T-Starts off with a tangy slightly sweet malt and citrus balanced by the hops. Lighter than expected for something that calls itself a "Winter Ale". Very refreshing though...I would like to have one of these in the summer. M-Light to Medium in the mouth, with average carbonation. Again, a refresher, not a warmer. D-This is a pretty drinkable beer...nothing to blow your socks off, but solid. Don't really understand why it is a seasonal...there is nothing "winter" about it, and I was expecting a higher dose of hops here. pours semi-cloudy light amber with a thin off-white head, almost no carbonation, and some lacing. smell is light grapefruit, wet ceder wood chips, spice, toffee, burnt sugar, freshly cut christmas tree. taste is oily, spice, fruit, bit of citrus, holly, caramel, somewhat bitter, hopy, and light malt, leaves the mouth on the sticky side. Bad Elf has a very thin, soap-bubble white head and a clear (a little hazy once the dregs are swished & poured), orange appearance, with lacing. The aroma is peppery, citrusy, and bready, and the taste is hop forward- citrus hops, sweet bread, bitterness, and cracker. The mouthfeel is light and watery, and Bad Elf finishes crisp, clean, refreshing, and mostly dry. The drinkability with this is ultra high. Overall, this is very good, and I recommend it. Pours a moderate brown color with a touch of an off white head and a bit of lacing. The nose brings a bunch of buttered bread lying underneath some mildly-appealing caramel and toffee notes. The taste goes down the wrong road, as the diacetyl really comes out here and takes over nearly everything. A bit of caramel, molasses, and maybe some spicing? It's really hard to tell with the butter. Mouthfeel is creamy and a bit gross. No reason to go through this whole beer; I did as much as I could to drink a few ounces but that was about all I could stomach. Had this courtesy of my friend Jeremy, much thanks. Poured into a pint glass, it straw orange mix. An almost white 1/4 inch head forms and quickly reduces to a partly cloudy day. Carbonation is noticeable and no sediment. The aroma is a earthy hop mix with a malty sweet backbone. Perhaps just a hint of nutmeg. The taste is a blend of earthy and pine hops with some citrus fruit and malty sweetness in the background. A little alcohol is also present. The mouthfeel was light/medium bodied. There seems to be a bit too much carbonation that overpowers the flavor. It feels crisp and leaves a clean finish, just a hint of spice. Overall, this is a reasonably drinkable beer but not something I would readily seek out.